Archery is a growing sport and the modern recurve bow, also known as the take-down recurve bow, is the starter bow that finds its way into the archery equipment of most beginners. It is also associated with the Olympics. The basic, traditional style hunter recurve does not have any bells or whistles and is using made of laminates or wood. Modern styles have balance weights, stabilizer rods, and sights. While many archers prefer not using a peep sight, they are necessary for some situations. Before making a purchase, it must be said that sights will not be of much use for someone who has trouble hitting the target from short distances such as ten yards. The problem for those people lies in the technique. A peep sight will not correct the problem. It could be detrimental because the user will stop focusing on the improvement of technique, draw length, draw weight, and stance. The result will be poorer performance later on. This test will help a person determine what the problem is. Ask a friend to use a bow, having a sight, to shoot a few arrows from a range of ten or so yards. Repeat the process with a bow without a sight. If the sight was not helpful, the problem is very likely a stance or form issue. Work on technique before buying a sight. Those without access to a friend’s bow or range can improvise by taping a straight stick such as a match to the bow in place of a sight. The technique is not a recommendation for a permanent solution but a means of determining a solution that involves a sight. If the ‘sight’ helped it is time to choose a specific model. There are two questions to ask if a sight is needed that will not hinder technique improvement. What type of sight is needed? What specific model is best? With the hundreds of options available, the choice can be confusing. This guide is intended to clear up the confusion. It will describe the basic sight types and what are believed to be superior models in some categories. The name says it all. It is an open ring. The idea is to line up the target so that it is seen in the middle of the ring. This type of sight is on the lower end of the price range and reasonably reliable. It is better for short-range shooting than far-range. The user cannot focus on a target that is too far away. As an illustration, form a circle the size of a quarter with the index finger and thumb. Extend the arm so that the circle is approximately the distance from the face as a sight would be when shooting a bow. Look at something ten yards away and then at something further away. The problem is evident. Specific open rings address the issue. One like the picture above that can be turned to narrow the size if the open ring is best. That mechanism is beneficial. It makes focusing on a target accurately possible. Some come with reliable inserts in different shapes and color like these. Choose one that is not distracting and does not ‘blend’ with the shot background. The open ring sight is an excellent choice for beginner archers. It makes the aiming process feel natural and doesn’t distract from the goal of hitting the target. Open rings make sighting the target easy. They are the best choice for practicing indoors at short distances. Most open rings cannot be used for far distances or outdoors. If you’re looking for a simple cheap sight that’s still high quality, check out the Baosity Archery Sight. The target point is precision drilled into the center of the lens with a lazer to ensure it is dead center! Pin sights are a little difficult to find for a wooden bow. Pin sights are readily available for the metal risers. Holes have to likely be drilled and inserts added if a pin sight is to be attached to a wood bow. Pin sights are available in ‘single-pin’ and ‘multiple-pin’ sights. The single-pin is most useful for static targets at a fixed distance. Archers use it when practicing. Multiple-pins sights are better for moving targets. They allow a pin choice ideal for a specific target distance. Multiple-pin sights are used for hunting outdoors. Instructions for calibration are included with the purchase. One pin is set for the archer’s average distance, one for longer shoots, and one pin for shorter shots. A pin sight is so basic and simple in design than any model will do just fine. Choose one that looks sturdy and falls within your price range. 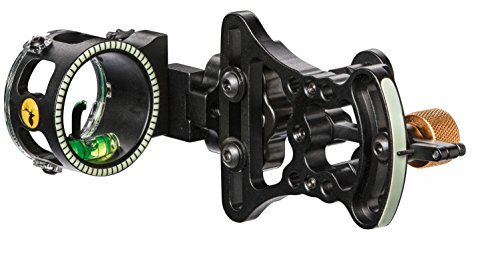 Amazon does carry the IQ Bow Sight Ultra Lite Three or Five Pin Compound Archery Sight that has Retina Lock Technology. It comes in the right- and left-hand versions. The sight increases range and confidence. An anchor point that is off ¼-inch can make a shot, made at 40 yards, be off by ten inches. Center the dot for ideal shooting. The retina lock technology controls muscle consistency, form, and memory. It allows longer shooting distances with tighter grouping. 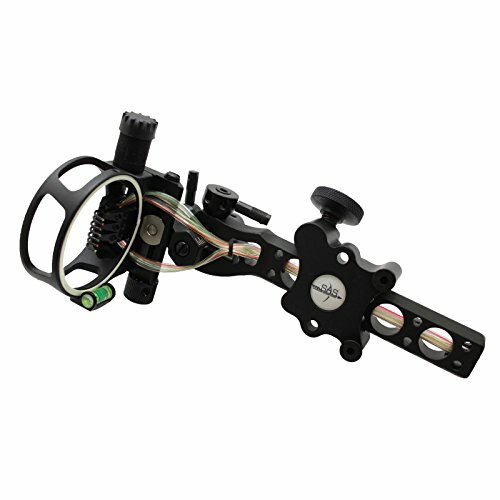 For more precise targeting, check out a 7 pin sight from Southland Archery Supply. This light has a built in leveling tool so you know your bow is steady and 7 pins gives you much more precise targeting, which is especially valuable when you’re out hunting! You never know exactly how far away your target is going to be when you’re out in the wild so a range finder and a pin sight are absolutely necessary! The range finder will give you the distance to your target and then you just need to choose the correct pin to line up with your target! With an asking price of hundreds of dollars, the target sight is the most expensive and advanced of all sights. Some archers do not think they are worth the money. For those who do, allow for windage and vertical adjustments. They can be combined with other recurve sights for ultimate accuracy. Considerable skill is required to use a target sight. It takes an experienced archer to make proper use of the sight. If money is no concern, they are fantastic things to buy for the fun they deliver. The Sure Loc Supreme 550 is highly recommended. It costs approximately $320. Amazon.com carries it at a slightly lower price. Two of its best features are its simplicity and light weight. The sight weighs a little over seven ounces and will not make the recurve feel too heavy. That claim cannot be made for all target sights. When choosing a sight, think about the purpose first. For practice, purchase a short-range sight such as a single-pin or open ring sight. For far-range, the target or multiple-pin sight will help adjust to different directions and distances. 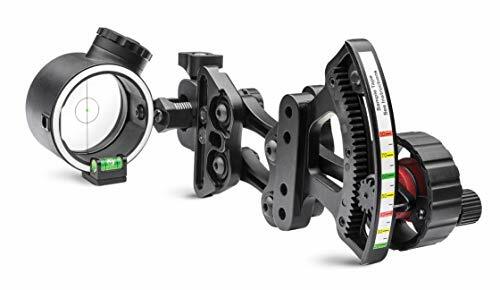 The Topoint Archery 3-Pin Bow Sight is always listed among the best recuve bow sights in the market. The 3-Pin bow also passed the check test which is one of the reasons it was listed as the top hunting or archery device. The device is also very light and made of high quality and durable material. 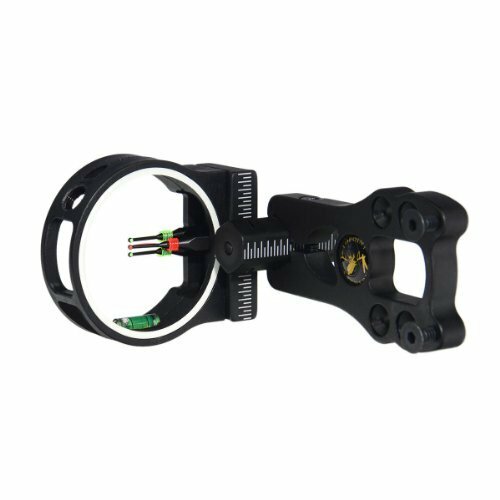 The main highlight of the 3-Pin Recurve Bow Sight by Topoint is the 3 horizontal pins which are good for shooting long and short distances. The device also comes with a lightweight which can add points to its mobility. It also facilitates a good marker for adjusting windage and elevation to acquire better sight target. What we liked the most about the 3-Pin Bow Sight by Topoint is that it very easy to use which can be very beneficial especially to beginners. It can also handle even the shortest or longest shot you wanted to make or aim for. The device is also easy to carry and durable. Most of all, it is not too expensive to buy! A possible downside for some users is the need to use an Allen wrench for adjusting which could be inconvenient to some users especially if you are in the field. Nevertheless, a hunter will always find a way to hunt! The Rover Pro LED Bow Sight by Truglo Range is always labelled as an archer's choice because of its well-designed aesthetics which are an improved version of the previously released product. The Truglo Range - Rover Pro LED is also an ideal bow sight for for 3D archery, bowhunting and target practice with your recurve bow since it is designed for accurate and precise sighting. The Truglo Range - Rover Pro LED has Zero - In adjustment dial and PWR technology which functions best in acquiring precise sighting. Both features work differently but come together to highlight better accuracy. The glow in the dark shooter's ring has 700-hour battery life and up to eleven brightness levels with an adjustable slider which highlights most of Truglo's bow sights. The accurate power dot sight, long battery life and additional accessories are just a few of the most liked features of Truglo Range - Rover Pro LED. The long battery life is convenient for users especially if going far to hunt while the additional accessories are useful in operating the device. With this device, you can easily adjust the arrow for fast targets. A few minor downsides seen on the product are that it is pricey, can be heavy for some users and the LED’s burnt after prolonged use. Burnt LED’s can be sorted out with the warranty. The Field Logic IQ Bowsight Micro is another top listed recurve bow sight for you to choose from especially in if you're into bowhunting. The Field Logic bow shares the same features but only differs in the number of pins. You can choose from 3, 5, and 7 pins depending on your hunting style. The IQ Bowsight Micro’s main highlights are the retina lock technology, rheostat light and adjustable micro knobs. All of the mentioned features are directed towards precise sighting. What we liked most about the Field Logic IQ Bowsight Micro is the retina lock technology which ensures precise target sighting. There is no reason to miss the target with the retina lock technology! The rheostat light also helps in lighting up the target for better sighting and accuracy. Additionally, you won't be needing tools to adjust the bow. The Trophy Ridge Vertical Pin Recurve Bow Sight is another product which can serve you with good quality hunting. 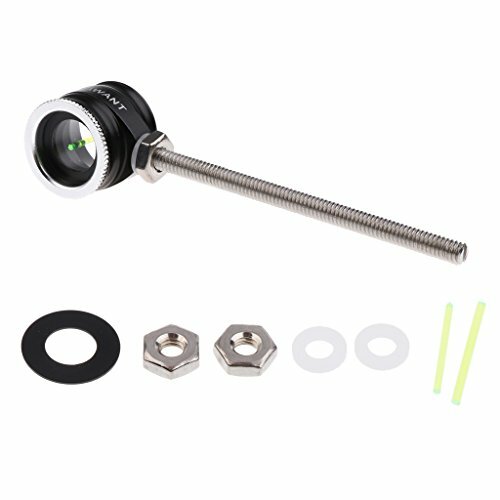 This isn't really listed as the "best of the best" product but we included this as it is a practical device to own for both beginners and experts. It comes with light durable material at an affordable price. The Pursuit takes pride in its feature called the Delrin bushings as it provides a quiet environment while releasing the bow. The Rheostat light also lightens up the fibre for better target sight. There are more useful features, what we have mentioned are the highlights of Pursuit. Firstly, you do not need expensive gear to be able to do what you love. There are inexpensive yet good quality hunting gear for you to choose from. Always opt for buying the ones that are best fitted to your budget. Second, know your hunting needs and style. Do not just purchase without planning what are you going to use it for. (You do not need a high-end bow if you are just hunting for birds) It would be useful if you educate yourself more about hunting or archery. Lastly, learn how to use your hunting gear to avoid misuse and accidents. Proper handling of hunting gear can guarantee safety while enjoying what you are passionate about. The above-mentioned products can be your choices in buying your very first hunting gear. The brief highlights and background of each product can help you visualize and choose the best bow for you. The pros and cons will also give you a little info of which specific bow is suited for your hunting style or needs. Again, consider your budget and know your hunting style and needs. Follow these two things and everything will come together!